American Bar Association, 9781627226974, 474pp. 2015 marks the 800th anniversary of the signing of the Magna Carta, widely recognized to be a pillar of liberty, major source of the modern concept of executive accountability, and foundation of the rule of law in the United States, the United Kingdom, and the Commonwealth countries. 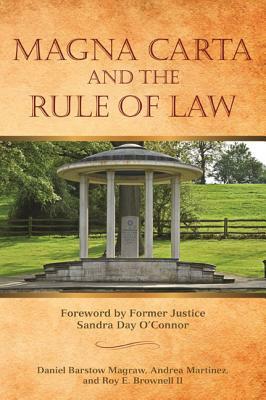 Magna Carta and the Rule of Law, is a comprehensive and insightful new book from the American Bar Association. It takes a fresh look at Magna Carta and its impacts on various issues and the rule of law in light of contemporary legal concerns. It includes an examination of the following aspects of Magna Carta; historical background, importance to constitutionalism and the rule of law, impact on the United States Constitution, executive power, role as a foundation for women's rights and individual rights (such as habeas corpus), relevance to international law, and much more. This fascinating book was written by a distinguished international group of scholars and features a foreword by Former U.S. Supreme Court Justice Sandra Day O'Connor. Daniel Barstow Magraw is a Senior Fellow at the Foreign Policy Institute, and a professorial lecturer at Johns Hopkins University School of Advanced International Studies. Andrea Martinez is an Associate with the International Justice Initiative at the Foreign Policy Institute at Johns Hopkins University School of Advanced International Studies. Roy E. Brownell II is an attorney residing in Washington, D.C.